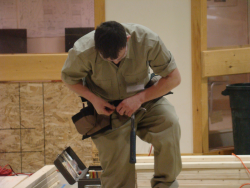 The Construction Technology program offers students an opportunity to learn the skills needed to become a successful and valued employee in the construction industry, with emphasis on construction carpentry and fine woodworking including cabinet building and computerized drafting using “Chief Architect Premier”. A recently added 2017 CNC (Computerized Numerical Control) 4′ x 8′ spindle controlled machine has enhanced CAD and CAM options. This equipment is rich in creativity and process oriented learning. Students learn in a well-equipped newly constructed modern shop at Region III Lincoln facility. In addition to the cabinet shop, a newly constructed lab utilizes modern equipment to design and build small buildings using modern building concepts. A wide variety of projects challenge students in a live real-world atmosphere. Projects range from digital computer design, rough framing of buildings, roofs, decks and application of siding to interior fine finish woodworking. Student’s daily plan and design layout projects from start to finish working directly with customers. The live work learning experience develops confidence and skill in a supportive and challenging environment. Students attend the program every other day alternating Region III with their sending school. This is a full day program; the student begins at 8:00 a.m. and ends at 2:00 p.m. The program is tailored to meet different student’s goals from rough framing (larger framed buildings) to fine woodworking (cabinets or built-in finish projects). From basic hand tools to modern larger stationary millwork equipment, students will learn to become comfortable with all their uses and awesome potential. In addition to the shop, the Building Trades Program provides classroom instruction leading to a competency certificate widely recognized and accepted by the industry. A nationally certified carpentry instructor presents the National Center for Construction Education and Research (NCCER) curriculum for students. This course of study developed by the National Center for Construction Education and Research is a standardized craft training process that prepares students for the challenges of today’s fast pace construction industry. Cianbro, a Maine driven employer, strongly supports this credential helping for employment entrance. In addition, potential (WCA) Woodworkers Career Alliance Tool Stamps are earned by demonstrated tool usage. layout a standard wall with appropriate framer’s shorthand. layout a simple rafter in a common roof pitch. demonstrate knowledge of crane signals. identify common construction components and materials in residential and commercial applications. complete a CPR and FIRST AID course. complete OSHA certification in general industry standards. complete a series of blueprint and home designs in “3D Home Design Suite”. 1.EMCC Building Trades articulation agreement. Up to a maximum of 15 credits. These credits apply to the Carpentry curriculum at EMCC. 2.NCCER course work is recognized by construction companies from coast to coast. Students become part of the national registry upon completion of the CORE Curriculum. Students must provide: ANSI certified steel tipped safety boots, a 25 foot tape measure, and always have a pencil. Optional materials: tool belt, basic hand tools. NCCER Core Curriculum. Prentice Hall, 2004. NCCER Carpentry Level 1 & 2. Prentice Hall, 2015. BROSCO Book of Designs, BROSCO Company, Edition B-90. Residential Carpentry (Reed), John Wiley and Sons, 1980. Various magazines and trade literature. Students are expected to have excellent attendance, work safely, follow all school rules. Students will be given a number of assigments and competencies that will have completion dates usually at the end of each quarter. Homework will include but not be limited to the NCCER vocabulary, reading assignments, review of safety handouts. Students are responsible to keep a notebook with ALL handouts and study sheets. This notebook MUST be present during each class session. Grading/Evaluation: Daily grades based on safety and participation in the class and shop areas, quiz grades( students should expect a minimum of one quiz a week), NCCER test scores. Grades are compiled and posted quarterly. Attendance: Students are expected to be present for each class session. Perfect attendance is not unusual for Building Trades students. Plagiarism: Students are expected to create their own plans and estimates, writing assignments are to be original works unless otherwise noted by the instructor. All sources must be given if a work is not original. Assignments will be disqualified as grade worthy if evidence of plagiarism is found. Students are expected to be able to work safely in the shop area at all times. Safety training is conducted during the first few weeks of class and then as needed during the entire year. Failure to follow safe practice can be a reason for termination from the program. All students will have embedded mini courses: VINYL SIDING, BASIC RESIDENTIAL ELECTRICITY, SOLAR HEATING AND GREEN HOME DESIGN. Students are expected to be able to layout basic framing diagrams, read simple blueprints, operate hand and power woodworking tools safely,calculate and estimate materials for building projects,learn customer relation strategies, measure accurately, and work appropriately with others. This course is held at Lincoln Facility .